FSU Art Professor will be at an art festival called ”Art Outside the Box” in Raleigh, NC sponsored by the Gregg Museum of Art and Design on October 29th from 12-4pm. This is the first of a series of 8 nationwide hand shaking events culminating in an exhibition in 2013. 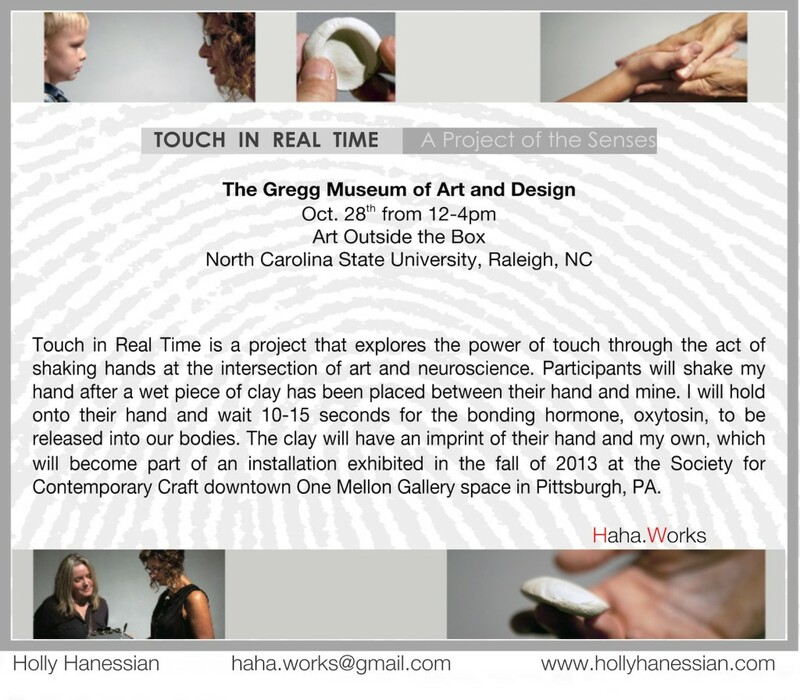 Touch in Real Time is a project that explores the power of touch through the act of shaking hands at the interaction of art and neuroscience. Participants will shake my hand after a wet piece of clay is placed between their hand and mine. I will hold onto their hand and wait 10-15 seconds for the bonding hormone, oxytosin, to be released into our bodies. The clay will have an imprint of their hand and my own, which will become part of an installation exhibited in the fall of 2013 at the Society For Contemporary Craft downtown One Mellon Gallery space in Pittsburg, PA.